Even though we can hear the time bomb of youth unemployment ticking, few governments have ambition or courage to tackle the problem. Youth unemployment - referring to those who are between 16 and 24 years old - currently stands at 13 percent (or some 73 million young persons), according to the International Labor Organization Worldwide, who calls it "a generation at risk". Given the weak economic state of many countries, youth unemployment has been increasing in most of part of the world. One may imagine that China - perhaps the only major country in the world that is experiencing strong gross domestic product (GDP) growth at this moment - would have a low rate of youth unemployment. And this could be the case. According to the official figures in 2010, it stands at 4.1 percent, which is significantly lower than Germany's currently exceptionally small 9 percent. However, figures from the Middle Kingdom are not necessarily comparable because it does not use internationally accepted metrics to measure youth unemployment. The result is that different sources reveal different pictures. 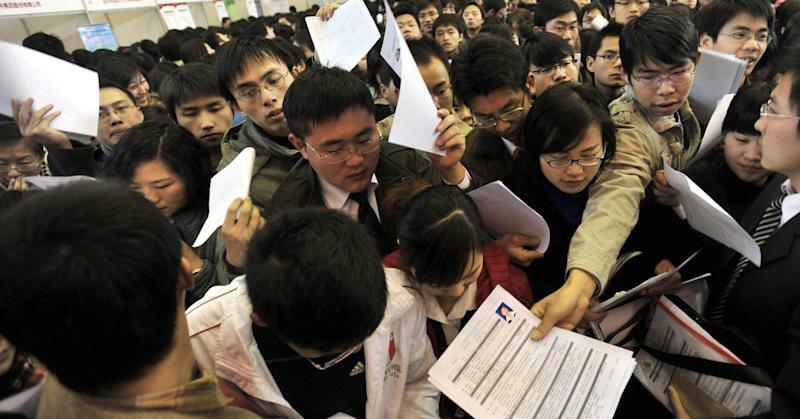 For instance, a report prepared by the China Household Finance Survey in 2012, puts China's youth unemployment at 8.1 percent. Others suggest that the rate to be as high as 20 percent. While the exact rate is up for debate, the underlying unemployment issue is not. This is particularly the case if we were to look closer at the relationship between level of education and joblessness. Drawn from the China Household Finance Survey, the figure below shows that those who are less educated are far more likely to hold a job than those who are better educated. In other words, the higher the level of education received, the higher the probability of not being able to find employment. This trend is in direct contrast with that in happening in the U.S. and the U.K., where higher education is more helpful to young people in securing positions. This observation is as unsurprising as it is worrying. It does not come as a surprise because China's economic miracle has insofar been driven by three sectors: export-driven manufacturing, construction and large energy and capital intensive heavy industries dominated by the state, all of which offer plenty of low-skilled, low-paid jobs but few white-collar jobs suitable for university graduates. Additionally, the flourishing transportation and catering industries, especially in coastal provinces such as Guangdong and Fujian as well as major cities including Beijing and Shanghai, have mostly created jobs that require nothing more than primary and junior secondary education. On the other hand, worries remain. While the better educated young people struggle to find jobs, businesses have been competing for low-skilled workers, which has led their wages to keep increasing. In 2013 alone, for instance, wages have gone up by over 10 percent, according to Bloomberg. At the same time, facing intensive competition from the neighboring Vietnam and Cambodia as well as weak export markets, Chinese manufacturers are under pressure to find ways to cut costs to remain profitable. Using automated production to replace physical labor therefore presents itself as a very attractive option for these companies. China accounted for 25,000 for the 162,000 industrial sold worldwide in 2013, slightly fewer than North America and Japan, according to a 2014 issue of Week in China. Moreover, between 2005 and 2012, sales of industrial robots in China have increased by about 25 percent per year on average. It also became the second-largest destination for industrial robots in 2012, according to the International Federation of Robotics. In the past, the government was more concerned with making jobs available to the country's large pool of low-skilled workers, especially young migrants from the rural regions. But as companies start to complain about labor costs and the shrinking labor force, automation is seen as the answer to these problems. On top of this, fully aware that it's more focused on low-cost manufacturing than its regional rivals and determined not to be left behind in the field of robotics, local Chinese governments have been promoting automation research and development, with a view to sell robots domestically and abroad. However, all of these could come at a high price - fewer people would be in employment as more machines are installed. Just as the country is not creating sufficient number of high-quality positions to soak up its educated youngsters, it seems quite plausible that production automation will be taking more positions away from those who are less educated. Looking from this vantage point, the country's youth unemployment is bound to deteriorate. Unlike the U.S., Germany and Japan, China cannot simply re-train the displaced low-skilled laborers to help them take up jobs that require better skills since these are far and few. A further ramification is that this could bring more discontent, thus endangering the social stability, cohesion and harmony that the Chinese government cherishes. To be sure, robots will not replace a massive number of workers overnight. In fact, given the high costs of advanced robots, technical limitations and the little flexibility in re-assigning tasks on factory floors, the shift to automation would take a while to become truly impactful. China should make full use of this window and move quickly to reform its economic foundations. Instead of concentrating on expanding manufacturing capacities, it has to invest in improving those industries such as professional services sectors and creative industries to take full advantage of the talents and skills of the many highly qualified young Chinese. Shortly after devising the "Three Laws of Robotics", science fiction writer Isaac Asimov came up with a less well-known fourth: "Law 0: A robot may not harm humanity, or, by inaction, allow humanity to come to harm". Humanity is of course not (yet) threatened by robots. Yet, with little action to tackle the youth unemployment issue as automation plays an increasingly important role in the Chinese economy, it will not be long before the future generations of Chinese lose out to robots. In this case, they can terminate our livelihood. Terence Tse is an Associate Professor in Finance at ESCP Europe Business School in London. Mark Esposito, Associate Professor of Business & Economics, Grenoble School of Management & Harvard University Extension School.